Coming off back-to-back Final Four appearances, Wisconsin was far from the paradigm of offensive firepower in its first-round matchup against Pittsburgh like it has been in recent years. But the Panthers weren’t much better, shooting 37.5% from the field to Wisconsin’s 32.1%. The Panthers were the stronger group inside early on, scoring their first 10 points of the game in the paint and posting a plus-seven rebound advantage in the first half. They led 22-16 at halftime before ultimately falling, 47–43. Led by its frontcourt trio of Vitto Brown, Nigel Hayes and Ethan Happ, Wisconsin clawed its way back with a 19–6 run that spanned more than 10 minutes across both halves. 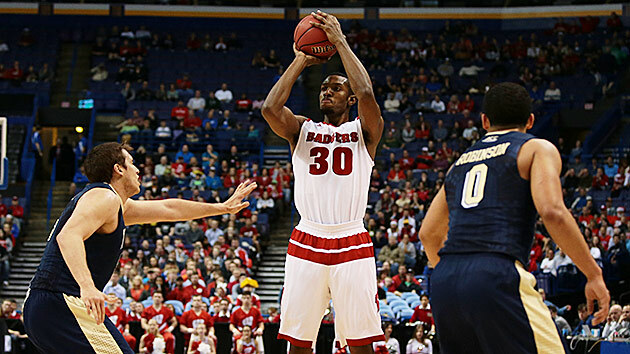 Happ gave the Badgers their first lead of the game, 25–24, with a dunk and the sides traded baskets down the stretch. The redshirt freshman led his team in scoring (15) and rebounding (nine). Brown hit a three to give Wisconsin a 42–40 lead that forced Pittsburgh coach Jamie Dixon to call a timeout. Happ then reeled in a monster defensive rebound on the next possession and scored off the glass on the other end. Pittsburgh junior forward Jamel Artis made a three-pointer to cut Wisconsin’s lead to 44–43 with 40.8 seconds left, but it proved to be the Panthers’ last basket. James Robinson missed a layup in transition—his 10th consecutive missed shot of the game—and Wisconsin won the game at the free-throw line. Wisconsin’s streak of consecutive NCAA tournament appearances was in jeopardy earlier this season when the Badgers had a 9–9 record and coach Bo Ryan unexpectedly retired in mid-December. But Greg Gard, the team’s once-interim head coach, rallied the troops, Wisconsin finished the regular season with a 20–11 record and Gard had the interim tag removed. On Friday, he earned his first NCAA tournament win as a head coach. Wisconsin’s strong finish to the regular season, its 18th consecutive tournament appearance and the team’s first-round win against Pittsburgh make for a successful follow-up after the Badgers lost five rotation players and Ryan from last year’s team. And their season isn’t over yet. Wisconsin will face the winner of No. 2 Xavier and No. 15 Weber State on Sunday. Normally, it would be safe to write about a potential Xavier-Wisconsin second-round matchup, but just hours earlier No. 2 Michigan State, one of the favorites to cut down the nets in Houston, suffered a first-round upset against No. 15 Middle Tennessee. But, assuming Xavier does win its first game, the Musketeers don’t have many apparent weaknesses for the Badgers to exploit. They have a rotation that goes 10 players deep, multiple defensive approaches, three-point threats and a core that played in the Sweet 16 last season. Xavier ranks 13th in the country in rebounds per game, so a win on Sunday will require toughness on the boards and keeping the Musketeers off the free-throw line. They average 19 made free throws per game (7th nationally) at a 73.1% clip (59th nationally). With the nation’s 24th most efficient defense, Wisconsin will have to slow down Xavier’s offense and hope the Musketeers don’t take advantage of the Badgers’ 320th ranked three-point defense. Xavier has lost twice in its last four games, but it’s 27–5 for a reason: it’s one of the best teams in the country.